It wasn’t all that long ago – though it seems like an eternity – we were reminded words matter. 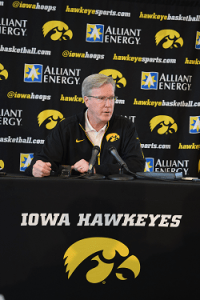 On Sunday, after his team had just blown a 16-point lead to lose in overtime to Nebraska on the road, Iowa basketball coach Fran McCaffery rekindled a passion for linguistics among Hawk fans. “In this league it’s tremendous,” McCaffery said. Iowa’s 10-10 record in Big Ten play. McCaffery was speaking to the relative strength of the conference as a whole, at least that’s an assumption one can draw given the context. Using the particular adjective when he did was tantamount to trying to put out a brush fire by spraying a tanker full of E-85 in the general direction of the nearest flame. For a team that started the Big Ten season in an 0-3 hole, to finish at the .500 mark seems like quite an accomplishment. For a team that was 10-6 in the Big Ten two weeks ago, to finish at the .500 mark seems like quite an implosion. The problem here, of course, is that Iowa fits both bills. Iowa beat Michigan by 15 points on Feb. 1 and won its next three games. Two of those victories came in incredible fashion with the Hawks coming from 15 down to knock off Northwestern at home before winning by a single point at Rutgers on a near physics-defying three-pointer at the buzzer. Since then the team has lost 5 of its last 6. The lone exception? An overtime win over an Indiana team that may or may not make the NCAA tournament field. Iowa fans aren’t feeling great about life at the moment. It’s almost as if they’ve completely forgotten that in November they’d have signed up 21-10 in a second following last season’s middling 14-19 mark. So, as the Hawks prepare to hop over to Chicago where they’ll face either Illinois or Northwestern this Thursday in the Big Ten tournament, McCaffery would do well to parse his words a little more carefully next time. As far as unsolicited advice goes, that’s not bad. Some may even call it tremendous.